Janey Richards was born in Sydney and lived and worked there till moving to Queensland in 1997. Janey has been exhibiting in group and collaborative exhibitions since moving to the Noosa hinterland eight years ago. 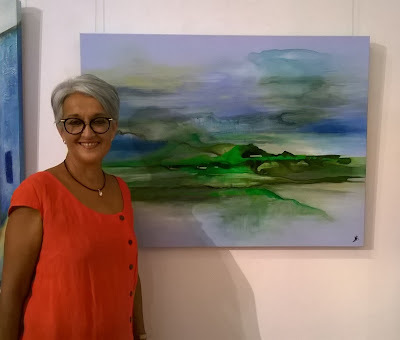 Her first solo exhibition "Freedom of Expression" was held at the Pomona Railway Station in 2017 and was a milestone in Janey's artistic development. Janey’s artworks are individual journeys of creativity mixed with emotion and colour. Her subject matters are inspired mostly by the vibrant colours of Queensland, the natural world and her love of abstract expressionism. Janey believes an abstract artwork can be something very definite to the artist, and it can be interpreted very differently by the viewer. It can be anything you want it to be! Janey is predominately self taught, however from a young age she was encouraged to develop her creativity by attending the Workshop Arts Centre in Sydney for several years. Janey studied art throughout her schooling and has enjoyed many tertiary courses in art appreciation, history, design and theory. She continues to enjoy and attend art workshops around the Sunshine Coast, Queensland. If you wish to enquire about any of my art or wish to purchase one for yourself or for a gift, please feel free to contact me at artbyjaney@gmail.com. Payments can be made by direct deposit or with credit card. Freight/post and packing expenses will be at cost price to the purchaser. I hope you enjoy viewing my art. Copyright Janey Richards. Simple theme. Powered by Blogger.